What Are the Functions of Sodium Carbonate in Soaps? What Is the Chemical Composition of Detergent? 2 What Are the Functions of Sodium Carbonate in Soaps? 3 What Is the Chemical Composition of Detergent? 4 What Is Triple-Milled Soap? Basic soaps are all made the same way--from fats and oils mixed with lye (sodium hydroxide). The type of fat or oil used determines how soft or hard the bar of soap is. The amount of lye controls how strong or alkaline the soap feels on your skin. Soap can also contain additives that provide its color, feel, strength, fragrance and texture, and stabilize and preserve. A heated lye (strong alkaline) solution is used to break down or saponify the warm fats or oils into components that then thicken into a pudding-like mixture and recombine to form soap. The mixture is added to molds to form bars of soap. 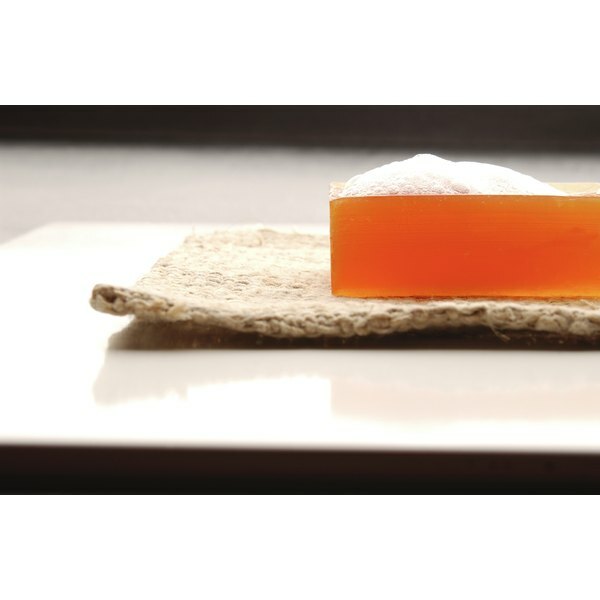 The solid fats that are used in the manufacture of soap include coconut oil, palm oil, tallow (purified beef or sheep fat) or lard (purified pork fat). Solid fats make harder soaps. Oils like olive, soybean, blended vegetable, avocado and canola form softer soaps. These chemicals enhance the reaction between fats and oils and the lye and cause the soap mixture to harden more quickly and evenly. Detergent ingredients decrease skin irritation caused by the soap without decreasing the sudsing and cleaning ability of the soap. BHT (butylated hydroxytoluene) is an antioxidant compound that is sometimes added to keep the oils in the soap from becoming rancid (decomposing and developing an unpleasant smell). Antibacterial products are sometimes added to kill bacteria on the skin. Antibacterial agents can be irritating to the skin if present in the soap in too high a concentration. Emollients are softeners and moisturizers that are added to make soaps and your skin feel smoother and softer. These chemicals are water softeners that stabilize dyes and fragrances and trap metal ions like calcium and magnesium to prevent these metals from combining with the soap to form soap scum. These agents are added to the soap mixture while it is hardening to color the soap. These are essential oil perfumes that are added to the soap mixture before it hardens to give the soap an aroma. Common fragrances include rose, lavender, lilac, lily of the valley, vanilla, almond, apple and violet. More exotic fragrances like basmati rice, chocolate, black tea, lettuce and grapefruit are also available. Emulsifiers are blending agents. They assure that dyes and fragrances combine evenly and smoothly with the rest of the ingredients in the soap. An organic chemist with a Master of Science from Case-Western Reserve University and a Master of Business Administration from Northwestern University, Ann Louise Truschel has been a freelance medical and business writer since 1982. Her client list includes big pharma, insurers, CME firms, medical journals, trade magazines, professional medical organizations, newspapers and The Department of Defense. What Kind of Oil Do You Use in Brownie Mix? What Is Clear Liquid Coconut Oil? How Does Homemade Soap Compare to Store-Bought Soap? What Does Coconut Acid Do in Soap?